SUMMARY: This is a collection of short stories all relating to the theme of family. Many are funny, though most have a thread of darkness as well. Think George Saunders or Aimee Bender, but a bit more Midwestern. THE BACK STORY: This evolved out of my dissertation. I took the stories that hung together with the family theme, and I wrote some extra to make it a full book length. WHY THIS TITLE: The theme was family, and this struck me as kind of funny but kind of folksy, which reflects my background and, hopefully, the stories as well. WHY SOMEONE WOULD WANT TO READ IT: It’s hilarious! Or weird, but in an interesting way. There’s a variety of stylistic approaches, so, hopefully, it doesn’t get boring. At Christmas, a family drives around town looking at holiday displays—it’s the kind of holiday pastime which for some families, is a family tradition, but in “Displays,” the mother and father are casing homes to rob. In “Eulogy,” a family prepares for the funeral of their father, but it’s not the real thing, just a dress rehearsal. And in “An Impulse Buy,” a couple runs a gamut of emotions while they are out looking for deals at garage and yard sales which becomes a lament for the throwaway materialism of the twenty-first century. Welcome to the bizarre and dark world of Zeke Jarvis. 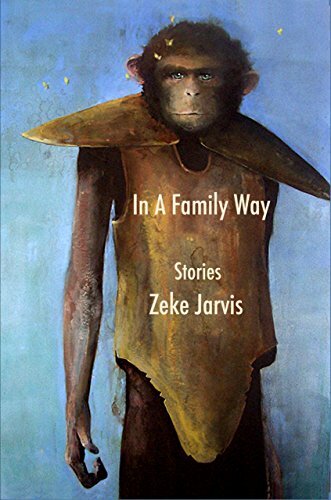 In his brilliant collection of short stories, In a Family Way: Stories, Jarvis pulls no punches. These stories are just as much visceral as they are cerebral. These are rich stories which peel back the veneer of any semblance of a neatly ordered life and then grip us with their gut-wrenching honesty and darkness. In many ways, I was reminded of David Lynch’s Blue Velvet. Everything might seem normal on the surface; yet, once you get past the superficiality it’s anything but normal. The stories in this collection are not for the faint of heart. However, if you’re looking for something dark and thought-provoking, you are definitely going to enjoy this collection. — Jeffrey Miller, Ice Cream Headache. After receiving his BA in both math and English from UW-Madison, Zeke Jarvis received his MA and PhD in English from UW-Milwaukee, where he was fiction co-editor and then Managing Editor of Cream City Review. Currently, he is an Associate Professor at Eureka College. His work has appeared in Bitter Oleander, 2 Bridges, Petrichor Machine, The Toucan, Gravel, REAL, KNOCK and Moon City Review, among many other places. His first book, So Anyway… was published by Robocup Press in 2014, and his most recent book, Lifelong Learning, was published by About Editions in 2018. Displays Zeke Jarvis My wife is pointing out a big Santa in a chimney on the left. “Watch” she says. Then, to our daughter Kaley, “There he goes”.